← Food crisis in Zimbabwe: 2.2 million at risk. But where do the figures come from, and what do they mean? Zimbabwe’s agricultural sector goes from ‘bread basket to basket case’? Or is it (again) a bit more complicated? With tedious regularity we hear the narrative that Zimbabwe has turned from ‘breadbasket’, producing sufficient food for the population and even exporting it, to ‘basket case’, with near permanent reliance on imports, even from Zambia of all places. The reason forwarded is the ‘chaotic’ land reform that undermined the basis of food production in the country – the large-scale commercial sector (try these from Foreign Policy, The Economist and the UK Daily Mail from the international press for starters – just google for many more!). Endless repetition often results in such narratives being accepted as fact. I have heard this argument from multiple sources, including those who frankly should know better. It’s a nice media sound-bite, and it serves particular interests. But what’s the truth behind these claims? As ever ‘myths’ of this sort have some element of reality embedded in them. 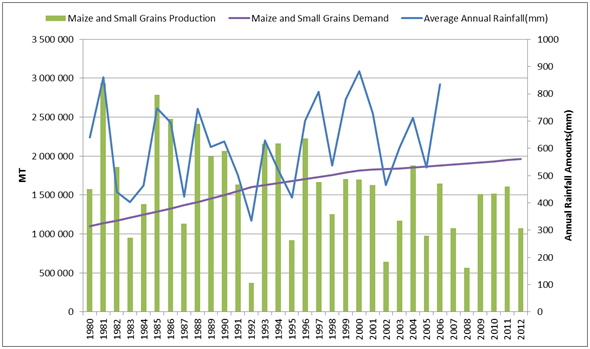 The graph below shows the pattern of maize imports since Independence in 1980. There is no doubt that maize imports have become more regular since 2000. In the coming year, we will likely have another high figure. But the argument that Zimbabwe never had to import food before is simply untrue. The major drought of 1992 resulted in the highest ever import requirements, exceeding even the most dramatic predictions for this year. And there were other occasions too in the period from Independence to the 2000 land reform – in 1993, 1996, 1997, 1998, 1999, and earlier in 1980 and 1984. Each of these was associated with production collapses, due to multiple causes usually precipitated by drought. If we look at the total production of maize and the pattern of rainfall (an averaged figure for the country as a whole) we see more interesting patterns. Since 1961, production has fluctuated dramatically, with the contribution of small-scale and large-scale production varying over time. The levels of variability have also increased over time, with grain (maize and small grains) production being much more tightly correlated with rainfall in recent years, and highly affected by climatic events. With longer-term climate change impacts likely to result in greater rainfall variability, this is concerning, and suggests the need for more drought proofing policies. The import figures are from FAOSTAT, with all the cautions and qualifications that go with that. They are therefore only official, recorded figures, and do not take account of informal cross-border trade. As we found out in Masvingo province during the 2000s, this is significant, involving all sorts of exchanges, with food flowing in often large quantities in both ways to Mozambique and South Africa. The grain production figures too are limited by the sampling approaches used, and are biased towards communal area production. Since 2000 sampling biases have meant that production from the A1 farms has not been accounted for sufficiently, although this is being corrected. Bearing all these many limitations in mind, what should make of it all? Is the ‘basket case’ narrative justified? The data show that since Independence there have been three broad phases that have affected the overall food economy. Identifying these helps to focus attention on what needs to be done now, rather than harking back to an assumed golden era past. In the immediate post-Independence period, there was much emphasis on food production. Government initiatives supported communal area farmers in particular through credit, loans and extension support. This was the much hailed phase of Zimbabwe’s ‘green revolution’. At the same time, large-scale commercial farmers continued to produce food, often through irrigation, as they had pre-Independence under the UDI sanctions regime. Towards the end of the 1980s and into the 1990s, especially following ESAP (the economic structural adjustment programme) from 1991, subsidies and other government support for communal area agriculture declined, and the nascent ‘green revolution’ collapsed. At the same time globally driven market incentives encouraged shifts of the commercial sector away from maize to higher value and often less land intensive production. This included livestock (with a big move of beef production to the Highveld), wildlife and game farming (for eco-tourism and hunting, including in the high rainfall areas), horticulture and floriculture (linked to supermarket value chains) and an expansion of tobacco. All of this meant that less maize was produced, although there was still a core irrigated production, increasingly of feed, that remained important. The impact of these changes on food production levels and methods was severely felt of course in the 1992 drought, but also in other years in the 1990s, resulting in an increasing frequency of imports. After 2000, things changed again with land reform, and the maize production under irrigation more or less disappeared, with the exception of a few A2 farms being revitalised in recent years. Communal area production remained depressed, and increasing land competition meant that surpluses were rare. Season to season storage was limited as small grains that store well were replaced by maize. It has taken some years for A1 farms to gain momentum due to establishment challenges, but for much of the 2000s, the economic crisis affected production dramatically. After 2009, and the stabilisation of the economy, things improved, but droughts affected production for several years, including the last season. Without irrigation on any significant scale focused on food production, output has become more variable and imports have been necessary. Thirteen years on, we would expect that the (no longer) ‘new farmers’ would be established. Most reflections on resettlement identify a decade as the minimum period for establishment and transition, but this assumes sustained support and investment. This has been starkly absent, both from government and donors who have shied away from development interventions in so-called ‘contested areas’. The result has been a slower improvement than hoped for. In our study areas in Masvingo, we see a progressive increase in the proportion of households producing more than their household food needs through the 2000s, with 30-40% regularly selling some surplus maize. However, the rate of growth has tailed off over time, as longer term challenges – of soil fertility and inputs, of infrastructure, of markets and so on – have hit. But overall production and levels of food security in the A1 farms remain significantly higher than in nearby communal areas. Unfortunately, as discussed last week, this dynamic is poorly represented in national figures on food production, as production from new resettlement areas often goes unrecorded, and increasingly such output, especially of maize, is channelled via informal channels, and so is difficult to capture in standard surveys. Production of maize from the new resettlements is however highly vulnerable to rainfall variation given the lack of irrigation. In addition, price and market incentives will probably continue to see a drift towards contracted crops, such as tobacco and cotton, away from food production, meaning that overall food deficits and import requirements will persist, even if across all commodities aggregate agricultural production and income increases. Since the 1980s, first large scale commercial farmers and now resettlement farmers have shifted from growing maize to other higher value commodities, for the same perfectly sound reasons. Since the 2000s, food production is even less resilient than it was in the 1990s, due to the lack of last-resort irrigation, either on state or private large-scale farms. The maize surplus era of the 1980s, when both communal and commercial farmers were growing large quantities, backed by government support, has long gone. But this does not mean that Zimbabwe’s agricultural sector is a ‘basket case’. It has restructured, and is confronted by new problems, requiring new solutions. Dreaming of the 1980s will not help. Zimbabwe has often imported food, and will continue to do so. This is not a bad thing if the prices are reasonable, and trade is efficient. However in times of regional drought, this is risky, and an emphasis on local production, and strategic reserves, is needed. As argued a decade ago by Thom Jayne and Mandi Rukuni, a simplistic policy approach to national food self-sufficiency does not make sense. Expensive, overflowing grain silos may not be the best indicator of a sound food economy, but instead there is a need for a resilient system that involves managed imports in times of drought combined with improvements in local production. Drought proofing such production is needed as a core policy to improve the resilience of the system. This includes improving storage systems, so that people can tide over from one season to the next; encouraging switching to drought resistant crops such as small grains, and continuing to invest in drought tolerant maize varieties; improving irrigation systems, including very small scale water harvesting systems, as well as ‘schemes’; and focusing on livestock as an important asset for exchange in times of drought. Price and market incentives need to ensure that it pays to grow food crops, and there is a balance between maize and tobacco production overall. This includes extending contracting systems to food crops, and improving input supply and other support to ensure that food crops are profitable. Efficient grain markets are essential to avoid distortions. Investment should be focused on areas where surplus production is possible, and this must include first and foremost the A1 resettlement areas. Ensuring effective market links so that such surpluses can be exchanged locally and regionally will be important. This will mean investment in roads, transport and so on, and avoid any restrictions on movement of grain and agricultural commodities. Looks like the ‘chickens are coming home to roost’ [see below]. The EU refusing to fund ‘contested farms’. Not at all surprising given the appalling manner in which those farms were ‘reclaimed’. It seems like that history is being re-written in favour of the despot Mugabe and his cronies. Just came back from Zimbabwe and I have only seen bare land with no food production at all. This is from Wedza to Harare and from the capital towards Kariba. Very sad as on the Mutare road used to be farms. And the same on the Kariba road. Why doesn’t national food self sufficiency approach make sense? Why pay for food imports when the country has prefect farmland to be self sufficient! Where does the money come from to pay for this food? Not from the diamante, that is stolen by the Chinese on a daily basis and Mugabe pockets the profits. The reason that there is bare land in October is that it is the dry season (although rains arrived in many parts of the country in the last week of October this year – an unusal event). We can look forward to green fields in the coming and months. a] Figure 1 clearly shows an increase in maize imports from 2002 onward. These are great data. If you simply fit a linear regression to the data from 1980 to 2000, and then a similar model from 2001 to 2011, and plot these you will see two lines that more-or-less highlight the difference in mean output – and the difference will be substantial. What are the mean and median estimates [along with variance] for these two periods? b] You comment on the fact that donors shy away from ‘contested farms’ as though it were out-of-the-norm. Given the appalling and racist manner under which those farms were taken, are you not surprised? Why are western donors obliged to finance people who openly support one of the more racist and homophobic regimes in modern times? c] The reason that farmers in your study area may now be dealing with issues such as soil fertility is because those lands [in the lowveld anyway] were regarded as marginal in the first instance, and thus why the ‘colonial settlers’ turned to beef, and then wildlife. d] You are right to say that ‘dreaming of a golden era’ is not useful – but there is absolutely no way that people should simply forget what happened over the past decade. There has to be compensation. No one is suggesting that the status quo ante be returned, but there has to be compensation. My point about the data is that there are three periods, not two: 1980-91, 91-2000 and 2000 onwards. Almost an order of magnitude [if you plot the data as dot points, the shift is almost exponential]. Quite obviously, we have a very serious problem regards maize production. b] The rational behind the targeted (one t) sanctions is violation of human rights. The EU and US have outlined these on their respective embassy pages. It’s a moot point because the (majority of the) public in those countries would not sanction (forgive me) the lifting of targeted sanctions. Basic humanitarian aid has always been provided. c] Your arguments regards compensation are looped (or circular? ), in that all you say is compensation should be scaled to debt, which means the former farmers will never see any compensation. It’s a clever way of rationalising no compensation – I think – while at the same time you call for the ‘new farmers’ to be provided funding from western nations? Are these not the same people who raped and beat the former farm workers, and the previous farmers? Yes, the 3 periods are clear. And yes there are serious issues around maize production, raising the (old) debate about whether there needs to be a strategy for national food security through produciton, or whether some allowance for imports makes more sense. This debate became hot in the 1990s, especially after imports started becoming more regular. Many economists argued (I gave a link to work by Thom Jayne and others) that a national food self sufficiency approach doesn’t make sense. On ‘sanctions’, see earlier blogs regarding the way the new resettlements have suffered from serious lack of investment as a result of sanctions, including in humanitarian terms, meaning that UN and donor commitments about health or education for all are not being seen through. This is targetted, but in my view in the wrong way. As most people argue, including the MDC, the politically targetted sanctions didn’t serve their purpose either. And, finally, on compensation, do read the blog linked earlier again. The argument is that compensation payments for improvements should be paid in line with the Constitution, but these should be paid for as part of a debt deal, not out of recurrent expenditures from the Ministry of Finance (who cannot afford more than wat is already being paid out). Dealing with the compensation issue for once-and-all will go some way toward achieving this. And full compensation for the white farmers who purchased their land after 1980 [with the Governments approval]. The sanctions were not against Zimbabwe and import and exports are never being boycott. it is aim to Mugabe and his cronies to stop them stealing money and investing this in Europe. It never undermined development. You seem confused, the 100% of economical boycott was from 1966 till 1980 and still the country was the second economy power in Southern Africa. I wonder why. Formal sanctions are of course limited and focused, but the wider impact is what we have been discussing. Such restrictive measures have prevented investment in resettlement areas, and much more besides. Combined with the withdrawal of lines of credit and finance, this has had a devastating effect. Are these FAOSTATS like for like including large donor imports like UNICEF Work for Food programs and general NGO imports or are they government only imports. Cross border input was substantial on an individual basis a few years ago. It is no longer happening at that level. Another serious point is the levelling of the the yields due to the points made in the blog and previous posts in the blog e.g. soil fertility. If this pattern continues the soil will get tired out further. The production will decline and fast track will become like communal. In 5-10 years this will mean the fast track surpluses which undoubtedly exist will no longer exist or amongst few just like communal. The point is summarised this way: the real food deficit will continue to increase year on year for the foreseeable future unless the problems are addressed. Eventually Zimbabwe will suffer the humiliation of food relief programs on what were commercial farms. No-one can believe the government would want to see that but the next budget will show if they are serious in preventing it. Conservation Farming is a way to address it but so is ox-based winter ploughing and manuring which makes a difference in the communal areas between food deficit and food surplus farmers. The more work put into the fields the more received over a ten year average. Mechanisation is fine but not an option at the moment for many. FAOSTAT data includes all imports. I do not have import data broken down by government/donor imports I am afraid. As I mentioned in the blog, this is only ‘official’ trade/imports, and all the informal cross border movement of goods is not accounted for. The same applies to the maize production statistics – again this is only the formal government figures. I believe these also significantly underestimate the level of production, especially on new resettlement areas (see last week’s blog). Yes, Chris did some excellent research linked to SCF around the time of the 1992 drought. I was at that time working in Chivi with the Ministry of Agriculture’s Department of Research and Specialist Services’ Farming Systems Research Team – includung several of the team members who continue to work on the Masvingo land reform work. We did a book called Hazards and Opportunities: Farming Livelihoods in Dryland Africa. Lessons from Zimbabwe (Zed Press, 1996) that addresses many of these issues in depth (sadly now out of print). The lessons learned then are as pertinent now – and indeed working intensively during that terrible drought has informed some of my recent blog commentary. We have been here before, and it’s not just all new. The above and a research paper by Dr. B.Ncube on the benefits of the use of manure in Western Zimbabwe show that Food security is easily achieveable with what farmers already have and a small amount of fertiliser. I did find the reported statistics in these papers that 60 per cent of farmers who have manure but do not use it touches on a serious point. It would seem a fair deduction from that percentage that a large number of farmers are contributing to food insecurity by not farming properly. With reference to your other query, the link I gave was to google books, but that is not for downloads, just viewing. It’s not full open access, but as near as is legal. Otherwise my books should be available in a number of libraries in Zimbabwe. All my books are sent to the following addresses, and hopefully are still available. So is it true that people took over highly functional farms, along with all of the modern farming equipment, kicked or killed the previous tenants, and then let fields go fallow, through ignorance and lack of agricultural methods? 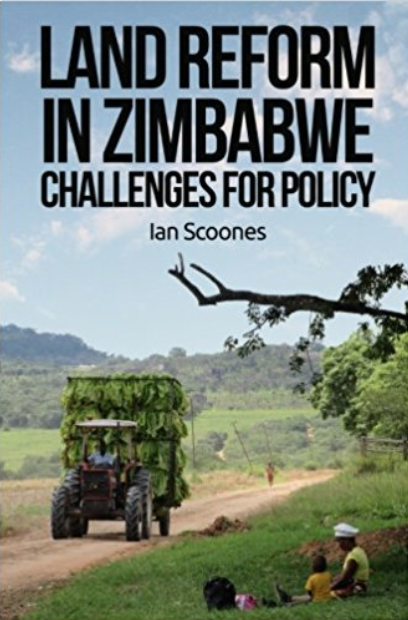 Do read more of the blog, and perhaps get hold of the new book: https://zimbabweland.wordpress.com/2013/12/09/new-book-debating-zimbabwes-land-reform/. You will find that, although there was violence during the land invasions, that there is land underutilisation, and that there have been difficulties in getting going on the new farms, there is a lot more going on than you suggest. Indeed, the position that you outline, despite being the favoured media narrative, is largely incorrect. It is indeed again a bit more complicated. Are you suggesting then that manner in which land reform happened in Zimbabwe is not the culprit to the extent the world makes it to be but that other inherent factors such as poor soil fertility, climate change, access to finance and markets, etc, that can be found elsewhere in the world are the main culprits? This article slides from Maize was imported due a drought once in a graph, to maize was “sometimes” imported to food was “often” imported. The author tries to argue that food production is somehow normal and that the new farms are now producing commercial crops. The only farms producing commercial crops are the comercial farms. The new small farms are inefficient and produce just enough for the farmers who live on them. A very dangerous writer. I don’t know whether they believe their own mental slips. I don’t know whether other reads see their mental slips. Either way this article will lead to millions being driven into poverty and starvation.